On June 7th 1883, Edwin Ralph Langton of Notting Hill made his way through Liverpool, England. Undoubtedly grief-stricken from the break-up with his first wife Ruth, the 31 years young gardener had resolved to make a great change. He was leaving his parents, sisters, and hard luck behind him to start anew in the Americas. As he boarded the Allan Line`s SS Circassian, he likely pondered what fate held for him in Quebec, Canada. Little did he know that he would meet and marry Martha to beget John, who begat Kenneth, who begat Danny, who would one day take a DNA paternal lineage test. I belong to the Stonemasons, haplogroup I, which is about 30,000 years old. The Stonemasons are best known for crafting pointed stone blades, known as Gravette Points, to hunt bison, horse, reindeer and mammoths. Stone played both a functional and religious role for the Stonemasons, who crafted voluptuous Venus figurines, possibly out of stealite, calcite, limestone or other soft stone. Although the exact significance of the figurines is not known, they may represent fertility or the Earth Mother goddess, a concept which prevails in many cultural mythologies. The Stonemasons could have regarded the Earth Mother as a symbol of security or as a deity who enabled plentiful harvests and numerous offspring. The Ice Age probably shaped the story of the Stonemasons. An ice shelf formed during the final stages of the Ice Age and moved as far as southern Ireland, mid England and northern Germany, covering all of Scandinavia, where the Stonemasons lived. Northern Spain and continental Europe were covered in tundra during these climatic shifts. As the Stonemasons moved their homes south to hunt game below the tree line, they settled primarily in the Balkans, southern France, Iberia (present day Spain and Portugal) and Italy. As they migrated, the Stonemasons played a possible role in developing the distinct difference in the languages of eastern and western Europe. When the Ice Age ended, many of the Stonemasons returned to their northern homes and repopulated Scandinavia, Iceland and northwest Europe. Based on my DNA test, it is predicted that I belong to a subgroup of the Stonemasons, haplogroup I1. This group may have participated in a coastal migration route about 10,000 years ago, during a time period archaeologists call the Holocene epoch. The I1 Stonemasons primarily occupied Norway, Sweden and Denmark, as well as parts of Finland settled by the Laplanders. Based on what is known about those regions and their traditions, it`s possible that my ancient ancestors worshipped the god Woden, also known as Odin. When Christianity replaced paganism, Woden was retained in the culture`s folklore as a historical king. Tales about Woden describe him as leading a wild hunt in the sky with a group of spectral horsemen. In a practical sense, this myth may have been used to explain thunderstorms. Woden is also reflected in modern languages - ``Wednesday`` is named after the god. 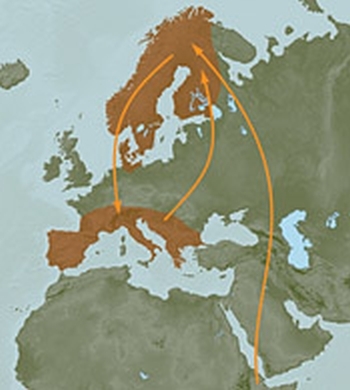 This map shows the likely migration pathways of my ancient ancestors, The Stonemasons. They travelled this path – settling for various periods of time at points along the way.